Calgary-based independent game developer Evil Objective Studios is thrilled to announce the release of its debut title Scribble Byte Scramble, which is available in the iTunes App Store for 99 cents USD. Scribble Byte Scramble features a unique blend of arcade and puzzle elements that has the player scrambling to connect same-colored ‘Bytes’ before they hit the ‘Fire Wall’ at the bottom of the screen. Big Blue Bubble Inc. has released a sequel to their smash hit iPhone game Burn the Rope, with over 6 million downloads. Burn the Rope: WORLDS, the hot new addition to the Burn the Rope franchise is finally available for an iDevice near you. The following is a statement on recent events which occurred at the office of Evil Objective Studios. Filthy. Freezing. Kinda smelly. These are just four of the five words used to describe the scene in an Alberta basement Monday morning where three of the studio’s designers were found. Tired, cold, and mildly infuriated with one another, the trio had been held hostage for months by their own iOS game. Details are sparse but it appears the three friends – who have no professional or practical experience in much of anything – were taken hostage by their iOS game “Scribble Byte Scramble” at some point early in development. Authorities suspect the trio was likely unaware of the dangers of game development. Possessing little money and even less sanity, the trio aimed to develop and release their game on a timeline and budget that was initially described as ‘brilliant’ – it has since been downgraded to ‘laughable’. The whereabouts of “Scribble Byte Scramble” – the game responsible for this catastrophe – are unknown, but it is expected to resurface in early September. Rumours suggest the trio are currently in recovery, receiving extensive treatments from an Italian pharmaceutical specialist. Toronto-based developer DrinkBox Studios has announced that it is working on a new downloadable PlayStation®Vita title called Tales from Space: Mutant Blobs Attack. A follow-up to Tales from Space: About a Blob – the studio’s first game – Mutant Blobs Attack will feature new levels, new powers and controls, and a new Blob player character. DrinkBox will be showing an early development build of the game this weekend at PAX Prime 2011 in Seattle. A team of seven students in the Masters of Digital Media program at The Center for Digital Media have come together to create an all-new physics-based puzzle game for iPads and iPhones within an ambitious timeline of 4 months. These students have also created Digital Touch Games, a brand new Vancouver independent studio. Crash Craving is their debut title. Crash Craving is designed with casual gamers and non-gamers in mind, making the game easy to play but difficult to master. 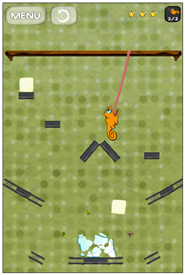 The game features a lovable orange chameleon fittingly named Mango. Mango is in search for food and he comes across jars of flies in a… French Cafe? That’s a classy meal right there and Mango knows how to get it. If you enjoy wreaking havoc in a fancy cafe by swinging like Tarzan with a super long sticky tongue, you’ll love this game. There are 50 levels to play through which is sure to provide hours of fun for just a single dollar on the iTunes app store. 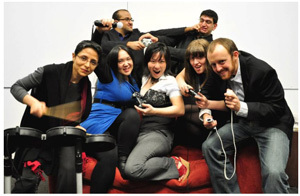 T he Masters of Digital Media program is a professional degree designed to be a practical program in which students are set up to work for real industry projects with real clients as well as some high profile companies like Electronic Arts and Microsoft. On the last semester of the 20-month program, the students are given the chance to pitch their own project ideas to the directors of the school as well as industry judges in the style of Dragons’ Den to gauge the viability and profitability of what is being proposed. Making sure that they get a shot at creating a game from concept through development and production, these students endeavoured to have a marketable, polished game within a semester’s time. Vancouver independent developer Daniel Truong has launched his Xbox puzzler Pixel Blocked! on XBLIG for 80 MS Points. We saw this game demonstrated at a Full Indie event earlier this year, and it looked like a game that would keep puzzle fans scratching their heads and solving puzzles for quite some time. Pixel Blocked! comes with 180 unique and challenging puzzles, all designed to put any gamer’s spatial logic, speed, and critical thinking skills through the gauntlet. According to the game’s site, the object of this simple and addictive puzzle game is to fill in the missing blocks in an outlined image by shooting blocks against an initial foundation. Players will advance through hundreds of increasingly difficult levels by learning to plan ahead and working with special game pieces such as Magnetic and Crumble Blocks.